Astronomers with the McDonald Observatory Planet Search project have discovered the first planet orbiting a star in a close-in binary star system. The discovery has implications for the number of possible planets in our galaxy, because unlike the Sun, most stars are in binary systems. The team announced their finding in a news conference at the American Astronomical Society's Division of Planetary Sciences meeting. 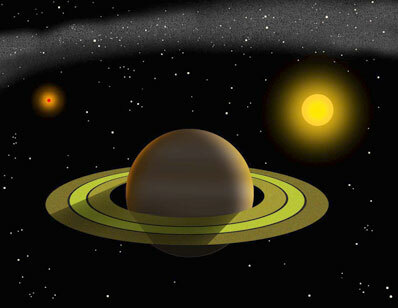 Artie Hatzes (Thueringer Landessternwarte Tautenburg), Bill Cochran (UT-Austin McDonald Observatory), and colleagues found that the planet orbits the larger star of the binary system Gamma Cephei, about 45 light-years away in the constellation Cepheus. The primary star is 1.59 times as massive as the Sun. The planet is 1.76 times as massive as Jupiter. It orbits the star at about 2 Astronomical Units (A.U. 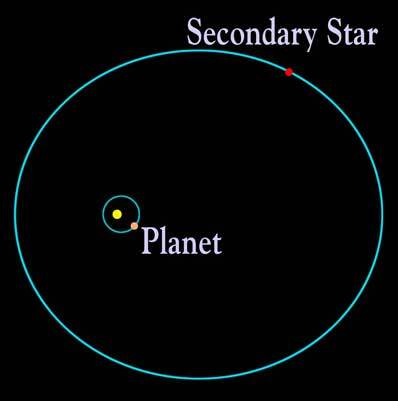 ), a little further than Mars's distance from the Sun. (An A.U. is the distance from Earth to the Sun.) The second, relatively small star is only 25 to 30 A.U. from the primary star -- about Uranus' distance from the Sun. Cochran's team began observing Gamma Cephei with the 2.7-meter Harlan J. Smith Telescope at McDonald Observatory in 1988. Prior to that, a Canadian team of astronomers used the Canada-France-Hawaii Telescope (CFHT) to study Gamma Cephei. Together, the observations total 20 years. "We think this is a planet because the variation has been nice and steady for eight complete cycles," Cochran said. "The star itself would not be varying that nicely for eight cycles over 20 years. Our observing techniques include several good indicators of stellar variability, and we see no variations that we can attribute to the star itself. The only logical thing that's left is a planet."